The story got a little bit worse before it got better. With electricity restored and gas on, I went to try the hot water tap on the off chance that the hot water system had magically taken care of itself. Worse. Not only wasn’t hot water coming out of the tap, there wasn’t any kind of water coming out of my tap. By now the situation was laughable. So after a call back to my connections guy who gave me the water company guy’s phone number, we worked out that they never turn off the water, and that it must have been turned off by “someone else”. A quick scout around the house (after the guy explained the two different meters I needed to check), I found out that in my (much) earlier attempts at turning my gas on had in actual fact switched off my water. And with the gas and water both pumping, the hot water system became significantly more cooperative and I was able to complete the trifecta. So as we speak this morning (this is being written offline on a train), I’ve woken up to hear my alarm (electricity) and had a warm (gas) shower (water) and so now all that needs to happen is for my phone to go online so that I can sort out the internet stuff and then we’re away. 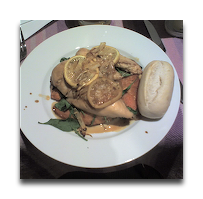 P.S – Any recounting of the evening would be incomplete without a mention of the unbelievable Lemon and Honey Chicken served up by the very patient, calming and beautiful Rebecca, who put up with an awful lot and showed another reason why she’s really way out of my league.